Cold and flu season officially starts in October and peaks in December. Ready to avoid it as much as possible? Me too! 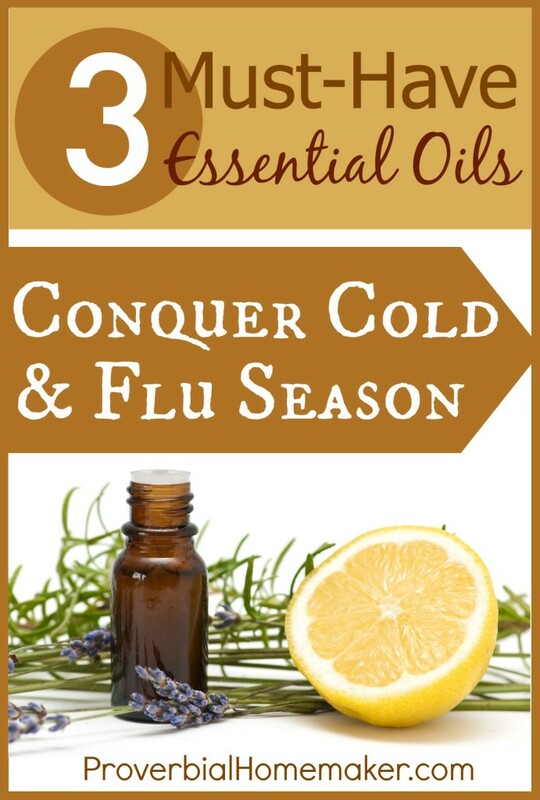 Here are my three must-have essential oils for cold and flu season. If you can only afford a few oils, buy these! I love them because they provide a great bang for the buck and are extremely versatile. In fact, these are the three oils that started me on my essential oils journey and convinced me that there really is something to all the hype. Immune Strength is a powerful essential oil blend that helps fight infections, inflammation, viruses, bacteria, fungus, parasites, and microbes. It supports the respiratory and circulatory systems and helps prevent flu, coughs, and colds. This oil is also useful as an expectorant and helps with cold sores, sinusitis, and headaches. Always dilute before topical application. Immune Strength is our go-to oil for preventing and treating cold and flu. It has helped me knock out severe headaches by breathing it in from a tissue or cupped hands. I have used it to help stomach aches. Of course, it is always what we use when the sniffles and coughs start to come on. This is not something you want to run out of, so order extra when you can! As a side note, I think it smells great, too. * (Update) Note that Immune Strength contains oils that are not generally recommended for kids under 6. You may consider other immune strengthening oils such as those listed below or try Tea Tree, German or Roman Chamomile, Melaleuca, or Thyme. As always, dilute properly. Lavender might be the most popular essential oil, and for good reason. Most people love the scent, but it is also one of the safest and most versatile oils available. It is reasonable to try it first for whatever you are addressing. For fighting cold, flu, and similar ailments, lavender packs a powerful punch. It is anti-infectious, anti-inflammatory, helps with insomnia, fevers, ear aches, indigestion, nausea, fatigue, and boosts immunity. Lavender is also known to help with headaches, muscle aches and pains, and is very calming. I love lemon because of the clean scent, versatility, and low cost. You can use it to reduce fevers, treat colds, boost the immune system, treat sore throats, bronchitis, and flu. It is also good as an air disinfectant when there are sick ones in the home. We often combine lemon with lavender. Not only do they work well together but they smell great. If you have a houseful of kids like we do, lemon and lavender will be your favorites! They are some of the most gentle and yet effective oils available. These three oils helped cut down on colds and flu a lot in our home last year and I know they will be star players again this year. You will come across different opinions about the best way to use essential oils, but from what I have researched, the most effective way is topically or with a diffuser. You can dilute the oils and massage them onto the soles of the feet or under the arms for quick absorption. Depending on the issue, you may want to try applying them directly to the area affected, such as rubbing onto the stomach for diarrhea or stomach aches. At our house, we use a roll-on to apply Immune Strength to everyone’s feet before and after church or other larger group events. If someone is starting to get sick, we diffuse lavender and lemon together and sometimes diffuse Immune Strength as well. There are a few other oils we use regularly to fight cold and flu, but these three are truly the must-have essential oils in your medicine cabinet this year! Rocky Mountain Oils (formerly Native American Nutritionals) is my favorite essential oils company because of their prices, quality, and integrity. You can read all about my skeptic’s journey with essential oils and how I landed on this great company. RMO has generously offered THREE Proverbial Homemaker readers a set of three cold and flu-fighting essential oils! 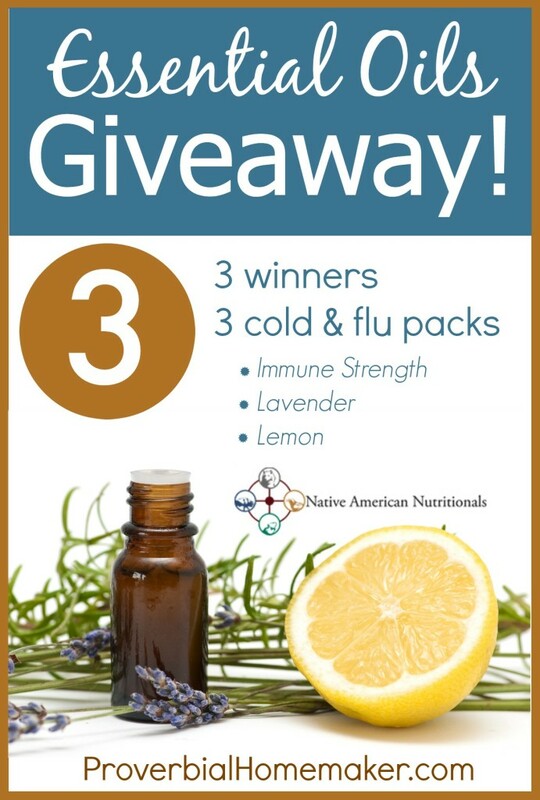 Enter below for your chance to win Immune Strength, Lavender, and Lemon. Entries accepted through 11:59PM on Friday, 10/3. Giveaway ends 10/4 at midnight. Winners have 48 hours to claim prize before another winner chosen. I have recently started using essential oils & really see their value. NAN is my favorite, too. Thanks! I don’t have a twitter account and really don’t want to get one, would that mean my entry doesn’t count? I have been learning about oils only this year. I would LOVE to win this as my beginning journey with EOs. I read how these were your first as well! So awesome to know that other Mothers are going a more natural way to caring for their families. God Bless, and thank you for the chance at such an awesome give away. Just started using Immune Strength with our family. Love it! Still trying to learn the correct dilution for children. What do you use to dilute it for your kids? And, how much do you dilute? Thanks! I use fractionated coconut oil to dilute, and you can buy that on NAN (http://go.nativeamericannutritionals.com/SH32) or on Amazon (http://amzn.to/XWIgsb), as well as many health food stores. I started using NAN Essential Oils because of your journey on your blog and your conclusion. I absolutely love them and am so thankful that you posted the process for the rest of us! Thanks! So excited about the awesome products in the giveaway!!! I have been stalking NAN oils for a few months now. I just started reading all about essential oils as I have been training for my first marathon. My massage therapist recommended a few to me since I had a flare up of asthma and a lower immune system. After researching, studying and such, I just ordered a few oils from them and am really glad to read about the products online. We just started using essential oils! I think I’m in love and I would love to add these to my collection! Yes all orders go through their web site. I’m sorry, I don’t have a discount code for ya! However, they often run specials and coupons, so make sure you sign up on their site for the newsletter or follow them on Facebook! Would you recommend using Immune Strength in a hand sanitizer? I’m trying to do my own hand sanitizer and I’m debating whether IS would be a good option to use. I work with small children all day and I’m constantly being exposed to coughing, sneezing, and outside germs. Yes, I think it’s a great option. I have also considered trying a witch hazel and oil blend recipe, but haven’t found one I like yet. First time to your blog. Really enjoyed it. Looking forward to using the jesse tree lego challenge with my boys! They love legos. On your roll on oil of lemon and lavender how many drops of each do you use? Hi Dawn! Glad you’re enjoying it. 🙂 Have fun with that Lego challenge! I usually fill up a little roll on bottle with about 5 drops of each to start with and then the rest carrier oil. If it doesn’t seem strong enough I double it. I tend to start on the low end just to keep from using more oil than I need or making it too strong, if that makes sense. Lemon has a feel good factor about it, always it makes you feel so fresh , lavender is also good though. I always love the Lavender, but why dont you recommend the peppermint ? Is that not good? You know, I just don’t like it that much. Lol! That makes me weird, I know. I have used it but I don’t like the way it makes makes my eyes and nose feel when I use it for headaches, for example. My kids seem to have the same reaction. But I know people LOVE it. What oils are in the immune strength? I’m in the Canada winter and looking for some good methods to avoid flu and cold, especially natural ones. And your information is very helpful for me. Lavender and Lemon are very familiar and also are two of my favorite oils. So it”s great! Thank you so much for sharing! Thanks for sharing the info.I love essential oil and have been using it for the cold and flu season too..Great posts!